Dorit Bar-On develops and defends a novel view of avowals and self-knowledge. Drawing on resources from the philosophy of language, the theory of action, epistemology, and the philosophy of mind, she offers original and systematic answers to many long-standing questions concerning our ability to know our own minds. We are all very good at telling what states of mind we are in at a given moment. When it comes to our own present states of mind, what we say goes; an avowal such as "I'm feeling so anxious" or "I'm thinking about my next trip to Paris," it is typically supposed, tells it like it is. But why is that? Why should what I say about my present mental states carry so much more weight than what others say about them? Why should avowals be more immune to criticism and correction than other claims we make? And if avowals are not based on any evidence or observation, how could they possibly express our knowledge of our own present mental states? Bar-On proposes a Neo-Expressivist view according to which an avowal is an act through which a person directly expresses, rather than merely reports, the very mental condition that the avowal ascribes. She argues that this expressivist idea, coupled with an adequate characterization of expression and a proper separation of the semantics of avowals from their pragmatics and epistemology, explains the special status we assign to avowals. As against many expressivists and their critics, she maintains that such an expressivist explanation is consistent with a non-deflationary view of self-knowledge and a robust realism about mental states. The view that emerges preserves many insights of the most prominent contributors to the subject, while offering a new perspective on our special relationship to our own minds. Critical study by Anthony Brueckner in Self-Knowledge, A. Hatzimoysis, ed., Oxford UP, 2010.
Review by Joseph Owens for Notre Dame Philosophical Reviews, 2007.
Review by Jordi Fernandez for The Philosophical Quarterly, 2006.
Review by Fredrik Stjernberg for Metapsychology, Vol. 10, Issue 38, 2006.
Review by Julia Tanney for Mind, 2007, 116: 727-732. 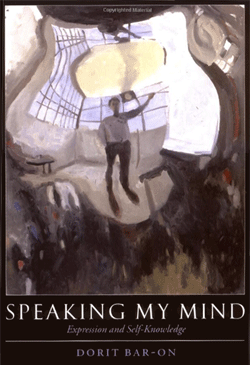 In 2010, Acta Analytica dedicated a special issue to issues on Expression, Mind, and Meaning. It features, among other things, responses to Speaking My Mind by Matthew Boyle, David Rosenthal, and Maura Tumulty, and my replies. Check out the special issue here.